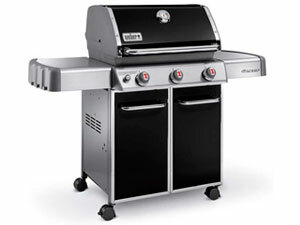 This sturdy and attractive grill assembles easily, with most buyers saying that it took between forty-five minutes and two hours to complete construction. The porcelain enamel finish looks every inch the part, and the silver and black finish looks smart and stylish. Customers have commented that the unit feels solid and heavy. People were generally impressed with the overall look of the unit, but several customers complained of peeling issues with the porcelain enamel finish. This unit is accompanied with a five-year limited warranty, and is backed with Weber’s customer service, which customers have reported to be outstanding. Customers were also pleased with the hideaway shelf for the propane tank and connecting hoses, and no regulator or ignition malfunctions have been reported. The instruction manual is complete with a recipe book, which customers have said contains some fabulous recipes, and a full manufacturer’s maintenance schedule, which might be of use preventing peeling and/or premature rusting issues. Overall, customers seem very satisfied with the cooking abilities of this grill. The ‘Flavorizer’ bar is a feature that customers seems very impressed with, stating that the food they had prepared on this grill was well-cooked and flavorful. They were also impressed with the porcelain enameled grill rack, which provided the sear marks everybody loves. The generous 637 square-inch cooking surface provided ample cooking space to feed a large gatherings of people, and the adjustable burners mean that you only need to light part of the grill to feed fewer people, which helps save fuel. Most people said that the deep firebox led to the unit being extremely reliable, even in windy conditions, and that the battery powered ignition system was reliable. Customers even stated that the unit is nearly silent when in operation, and there were no signs of the hissing noises that typically accompany cooking on a propane fuelled grill. Buyers were mostly impressed by the speed at which the grill gets up to cooking temperature, however some complained that the unit wouldn’t achieve an appropriate cooking temperature at all, and the heat is not spread evenly across the cooking surface. The built-in thermostat was happily received by buyers, who reported that it took all the guesswork out of cooking their meals. One final complaint is that the grease removal system in inefficient; grease and drippings gather in the system and burn, causing flare ups and difficulty in cleaning the unit.